A couple of days ago I shared the start of my master bedroom redo, the painting of the ceiling with Benjamin Moore White Dove in Pearl, and now we’ll move onto painting the master bedroom walls and crown molding that we installed. After the ceiling, I painted all of the trim in the whole room using Benjamin Moore White Dove Advance (the same gallon I used in my bathroom redo to paint the trim and vanity). The walls had a couple of spots where the paint was puckered and loose. To fix it I scraped off the old paint, then I spackled and sanded and painted the walls, Benjamin Moore Hazy Skies Regal in eggshell finish. After the walls were done, we started the crown. This is the first time we put it up and the first try was not successful. We couldn’t get the first two pieces lined up (maybe it was because the hubs was trying to put 2 different pieces of molding together, gah). Once he figured out what the problem was, the second day (second attempt) was much better. It all went up pretty quickly, in about 2 hours. 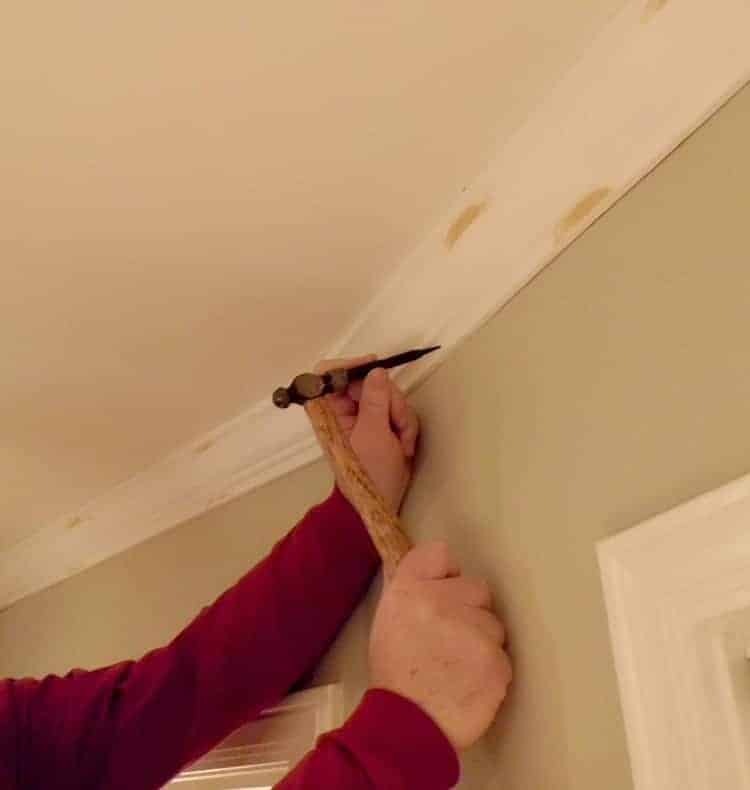 In the picture above, my husband is using a scrap piece of wood cut to size to mark the wall where the bottom of the crown molding has to sit. He marked the walls every two feet with a pencil around the whole room so that each piece would line up once it’s on the wall. After making his cuts outside on his chop saw, he put up the molding. We did buy a nail gun, to use with his compressor, to make the job quicker and easier. Here is a side view of the molding when it is up. 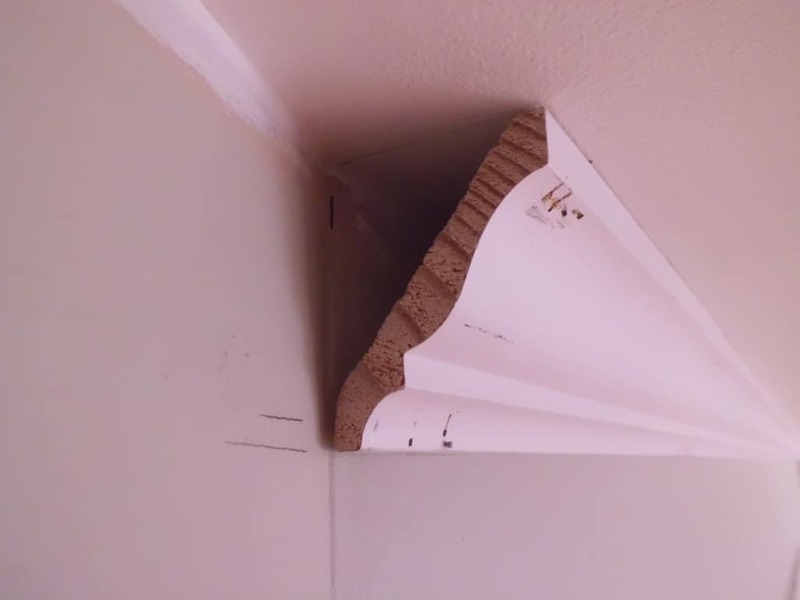 You can also see the pencil marks where the bottom of the molding needed to sit. 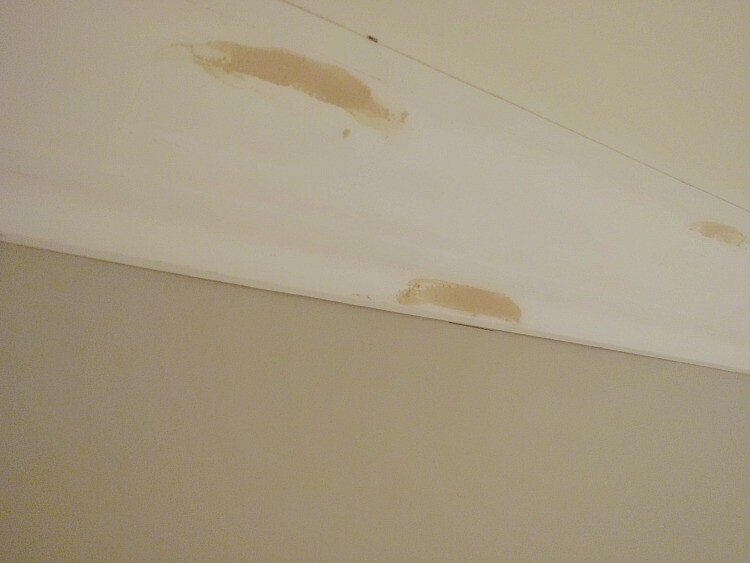 After all of the molding was up, my husband went around to all of the nails that were sticking out a little and used his nail set to tap the heads in. Then it was time to caulk all of the joints and to use wood putty on the nail holes. We used wood putty because caulk and spackle can rust the head of the nail, which can cause a spot on your finished paint. Once all of the putty dried, the hubs sanded the spots (he said this was the worst part of the whole job). After the molding was all sanded and caulked, I got to work painting it. I used the BM White Dove that we used on all of the other trim in the room. And that’s it. It wasn’t a necessarily hard job but it did take some time to do. I’m so glad we did it though because I think it makes the room look more finished. Next up is the reveal of the finished room and what we ended up spending for supplies. 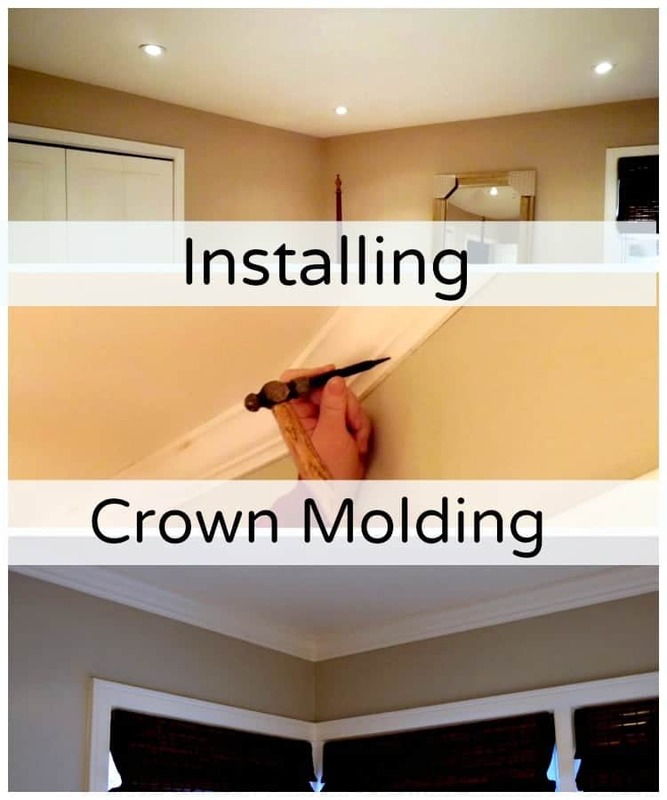 Have you put up crown molding? What do you think is the worst part of the process? Thank you Kristi. That’s amazing. It’d be rare, in Australia, to have a room finished with no cornicing at all. It’s just a given. It’s very easy to work with, and very cheap. They just glue it to the ceiling with big globs of plaster glue. As I say, there are many different profiles available, and you can layer them for a more interesting effect. Thanks again. So interesting Liz. It would be great if all homes here had crown molding already installed, a lot less work. As you saw in my post, we apply crown here using nails. Do you typically paint cornicing? There are different profiles of crown here also, and there are people who layer them for different effects. Sounds like we use them similarly, just a different material. Thanks again for your input. Have a great day. Kristi, yes cornice is always painted, just as you would paint your plasterboard (I think you call it dry wall??). It’s essentially the same product. It’s usually painted the same colour as the ceiling (ordinarily ‘ceiling white’), but where more ornate cornices are used it can add dramatic effect when painted in contrasting colours. You most often see that in older buildings, or restoration properties, and is rarely used elsewhere. My husband and I were considering why the USA would use timber instead of plaster for this purpose. The only thought is, maybe you have more timber and we have more lime! Ha ha. Thanks for the lesson on plaster cornicing Liz. Now I am curious now to find out why you use plaster in Australia when we use wood in the U.S. I would think that plaster cornicing was used in the very old homes in the U.S. (but I’m not 100 percent sure). Houses were more ornate with beautiful moldings way back then. Off to see what I can dig up. What a great blog you have. Thanks so much! I’m really interested in your crown moulding. I’m in Australia and we don’t use timber for this purpose. We have lengths of cornice plastering in different profiles. Some can be really ornate, others quite simple and clean-lined. I imagine you also have this product in The States? Can I just ask why you would use crown moulding over plaster cornice? Just curious really. Also, was there nothing at all there before? Just walls meeting ceiling? That’d be very odd, and no wonder you wanted the moulding! Hi Liz and welcome to Chatfield Court. Thanks so much for your comment. I have to admit that I had to look up cornice plastering. You will find wood crown molding readily available in the U.S., not sure if you can an average home improvement store and get cornice plastering. We use the wood because it is lightweight and very easy to work with, I would think it’s cheaper also. A lot of homes don’t have crown molding here. It’s usually an added decoration in the States. There was none when we started on this room, just wall meeting the ceiling. We have a couple of more rooms to add it to so we’ve got our work cut out for us. Thank you for your interest, hope I answered your questions. I will surely check the home improvement store for cornice plastering the next time I go.